In an exclusive interview with AFP, Mowaffak al-Rubaie talks about the process of putting the Iraqi dictator to death. MOWAFFAK AL-RUBAIE sits in his office with a statue of Saddam Hussein behind him, the rope used to hang the dictator around its neck, recalling his final minutes. The former national security advisor, who oversaw Saddam’s 2006 execution, said he remained strong until the end, and never expressed any regret. “A criminal? True. A killer? True. A butcher? True. But he was strong until the end. “I received him (Saddam) at the door. No one entered with us — no foreigners, and no Americans,” Rubaie said in an interview with AFP at his office in the Kadhimiyah area of north Baghdad, near the prison where the execution took place seven years ago. “He was wearing a jacket and a white shirt, normal and relaxed, and I didn’t see any signs of fear. “Of course, some people want me to say that he collapsed or that he was drugged, but these facts are for history,” Rubaie said. “I didn’t hear any regret from him, I didn’t hear any request for mercy from God from him, or request for pardon. “A person who is about to die usually says, ‘God, forgive my sins — I am coming to you.’ But he never said any of that,” Rubaie told AFP. Saddam Hussein, who ruled Iraq for more than two decades marked by brutal repression, disastrous wars and punishing international sanctions, was hanged after being found guilty of crimes against humanity for the 1982 killing of 148 Shiite villagers in Dujail. He was president from July 1979 until the March 2003 US-led invasion of Iraq, and was found by American forces hiding in a hole on a farm in December of that year. 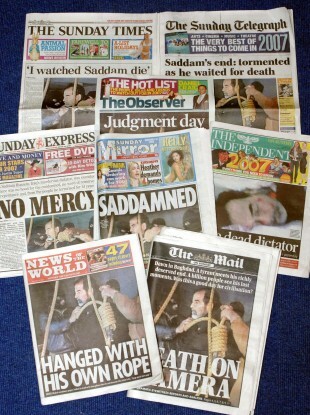 Saddam was executed three years later on December 30, 2006 after a summary trial. Some Iraqis, particularly Sunni Arabs, look back fondly on the time of Saddam’s rule, especially the periods of internal stability that stand in stark contrast to the brutal violence that has plagued the country since his overthrow. Saddam is also held in high regard by some Arabs for his 1980-88 war with Iran, his confrontations with the United States, his strikes against Israel, and his composure during his execution, which was recorded on mobile phone videos. “When I brought him, he was handcuffed and holding a Koran,” said Rubaie, ignoring the statue of Saddam behind him, which depicts the dictator dressed in a uniform bearing the insignia of his exclusive military rank. Rubaie then took Saddam to the room in which he was to die. When it was time for Saddam to mount the gallows, his legs were still bound, so Rubaie and others had to drag him up the steps. Just before he was hanged, witnesses taunted him with shouts of “Long live Imam Mohammed Baqr al-Sadr!” and “Moqtada! Moqtada!” — references to an opponent of Saddam who was killed during his rule, and the dead man’s relative, who rose to command a powerful militia after 2003. Rubaie said he pulled the lever to hang Saddam, but it did not work. Another person he did not name then pulled it a second time, killing him. Just before he was hanged, Saddam began to recite the Muslim testament of faith. Rubaie went under the gallows to retrieve the body, which he said was put in a white bag and placed on a stretcher. The body was then transported in an American helicopter from the prison where he was hanged to Prime Minister Nuri al-Maliki’s residence in the heavily-fortified Green Zone. The helicopter was crowded with people, Rubaie said, so the body had to be put on the floor, and the doors of the helicopter were left open during the flight, as the stretcher was too long to fit otherwise. “I remember clearly that the sun was starting to rise” as the helicopter flew over Baghdad, Rubaie said. At his residence, “the prime minister took our hands and said: ‘God bless you.’ I told him, ‘Go ahead and look at him.’ So he uncovered his face, and saw Saddam Hussein,” said Rubaie, who is still a close ally of the premier. “I have never had such a very strange feeling,” Rubaie, who was thrice imprisoned during Saddam’s rule, said of participating in the execution. Bush gave him a thumbs up, signalling his approval. Email “'I didn't see any signs of fear,'- The man who oversaw Saddam's execution speaks”. Feedback on “'I didn't see any signs of fear,'- The man who oversaw Saddam's execution speaks”.